Treyarch has released a new Call of Duty: Black Ops 4 update that brings the v1.11 update to PC along with other updates to all three game modes. While not as large as January 15's massive v1.11 update on PlayStation 4 and Xbox One, the latest Black Ops 4 update includes some important changes that should please all players. Along with the Blackout free trail going live on all platforms, both Zombies and Multiplayer game modes have seen some key improvements to smooth out gameplay. What will likely end up as the most anticipated improvement with this patch is perhaps also the smallest. There will now be a "Clear all New item markers" to clear out the "New" notification in the Personalization menu of the game. Fans have been asking for this feature almost from Day 1, meaning players will no doubt be thrilled to see its inclusion. Fans of the new Gauntlets mode in Zombies will be glad to see the new improvements included in the latest update. Zombies Gauntlet received a few key improvements that will surely help iron out some of the kinks present in gameplay at launch. Issues including players not being able to purchase wall-buys and losing weapons in certain rounds have been fully resolved with the January 17 update. Finally, Multiplayer fans on PC got a bit of specific love to improve a couple of small issues with Classes and the Zero Specialist. For those who still haven’t experienced the thrill of the hunt in Blackout, our Free Trial is now live and runs through 10AM PT Jan. 24 on PS4, Xbox One, and PC! Grab your friends (and enemies) and jump in for free – it’s going to be a wild ride. After downloading and installing the Blackout Free Trial from your platform’s store, you’ll be able to party up with players who have the Free Trial and with friends who already own Black Ops 4, so everyone in the Call of Duty community can play together. Free Trial players will also earn Echelon progression and unlock Black Market Tiers and loot during the trial period, with no limits on playtime or player progression. All Platforms: Register for a free My Call of Duty account if you haven’t already. PS4 and Xbox One: In the console store, search for and download the Blackout Free Trial. When the download completes, start up the game and jump in. PC: Go to Battle.net and log in with your account, or register if you haven’t already. Find “Call of Duty®: Black Ops 4”, and click the “Try For Free” button. Once the download is complete, click “Play” to launch the game. Our PC 1.11 update is live today with several PC-specific improvements listed below, in addition to the details laid out in our console 1.11 patch notes. Our PC team is also investigating community feedback regarding shotguns in Blackout and sniper rifle performance in Multiplayer. As always, thanks for your feedback while we examine the data – the team is dedicated to maintaining weapon balance on PC for fair and consistent gunplay, especially as new weapons are added to the game. 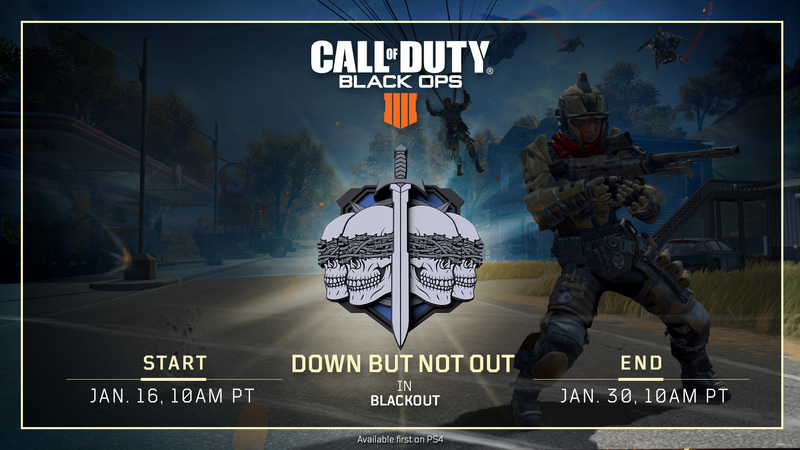 To celebrate the launch of the Blackout Free Trial, we’ve introduced Down But Not Out this week in Blackout on PS4! In our newest limited-time mode, fallen teammates redeploy with each new Collapse as long as one player in the squad remains alive. This new gameplay mechanic completely changes the tactical approach of the game – if you’re the last surviving member of your squad, you’ll need to make damn sure you can stay in the fight until your teammates redeploy, and plot a new course of action with your reunited squad to take on the other survivors. Remember, other squads will be parachuting in with you through the match, as well. Players redeploy with a pistol, a handful of ammo, and five bandages, so you won’t be left empty-handed when you drop back in for revenge against the squad that took you out. Players can no longer redeploy once the countdown to the final Collapse begins, so strategize accordingly if you want to be the last squad standing. By the way, Collapses also happen more frequently this time around. If this all sounds like a recipe for an insane final circle, you’d be correct – be prepared for some of the craziest game-ending fights you’ve seen in Blackout to date. Jump into the new mode on PS4 and let us know what you think in the comments! We’re planning to run Down But Not Out for two weeks on each platform, so everyone will have plenty of time to drop in and try it out. 11AM PT UPDATE: Added new updates across all three modes on PS4 and Xbox One, with PC update to follow. See “PS4 and Xbox One” section below for additional patch notes. 12:30PM PT UPDATE: “Clear all New item markers” button now clears “New” notifications in Personalization menu on all platforms. Blackout Free Trial now live on PS4, Xbox One, and PC. PC 1.11 update now live. Down But Not Out limited-time mode live in Blackout (PS4). Improvements to looting interface and ARAV passenger hit detection in Blackout (PS4 and Xbox One). (Updated 11AM PT). Improvements to Zombies Gauntlets (PS4). “Clear all New item markers” button now clears “New” notifications in Personalization menu. Fix for Gunship camera resetting when switching ammo types. Misc. stability and bug fixes in Multiplayer and Blackout. Play Blackout for free through 10AM PT Jan. 24 on PS4, Xbox One, and PC. Free Trial players earn Echelon progression and unlock Tiers and loot through the Black Market, with no limit on playtime or player progression. Download and install the Blackout Free Trial from the store on PS4/Xbox One, and from Battle.net on PC. Fixed crashes that could occur in certain cases when joining a lobby and during infiltration at the start of a match. Resolved an issue with the Gunship camera resetting when switching ammo types. Fixed a UI error tied to purchasing items in Blackjack’s Shop. Fixed a crash that could occur when a Zero player hacked Torque’s Barricade. Fixed a crash that could occur when using Prophet’s Tempest. Resolved an issue where a red triangle would appear on the Armory button after leaving a CWL Custom Game. Playlist now live in Blackout on PS4 through Jan. 30. Fallen teammates redeploy with each new Collapse as long as one player in the squad is still alive. Players redeploy with a pistol, limited ammo, and 5x First Aid bandages. Players can no longer redeploy once the final Collapse begins. Collapses occur more frequently than in standard Blackout game modes. Play in squads up to 4 players with a maximum total of 100 players per match. Resolved an issue with players not being able to purchase wall-buys in certain situations. Resolved an issue where the player would not have their Mule Kick weapon returned to them after round 14, if Mule Kick was acquired via the Perk Up elixir. Updated the weapon descriptions in the rules for three rounds. Replaced a thumbnail in local play to properly display “Unsinkable” for the new Gauntlet. Fixed a crash that could occur when players were downed during Gauntlets. Added a new Gameplay option to allow using "Repair Armor" as a toggle instead of a hold. Added Gamepad option that allows tweaking Reload behavior in Blackout. Resolved an issue where the weapon slot could change between Primary and Secondary when picking up attachments. Improved prompt visibility on Zero's Ice Pick. Resolved an issue where the player could not use "Change Class" shortcuts while the Change Class panel was opened. Added "Change Class" keybind shortcuts for slots 7 to 12. Added "Steady Aim (Toggle)" keybind. "Center View" keybind will no longer instantly snap the camera to center position. Resolved an issue where the player could not swim up with the "Jump Button Also Mantles" option set to "Off". Resolved an issue in the looting interface with Stash items being reordered when the player looted items from a Stash. Resolved an issue with hit detection on ARAV passengers hanging out of the window. Resolved an issue that resulted in items being purchased multiple times automatically. Tac-Deploy now properly expires after intended duration in the field. Replaced missing voiceover lines for Zero. Using an EMP Disruptor on an enemy with Tactical Mask equipped will now display the Tactical Mask icon on-screen. Closed an exploit where the player could use the Ragnarok DG-5 to reach an exploitable area on the Docks Bridge. Fixed a crash that could occur when a player disconnected before a Wonder Weapon charged shot was cleared.